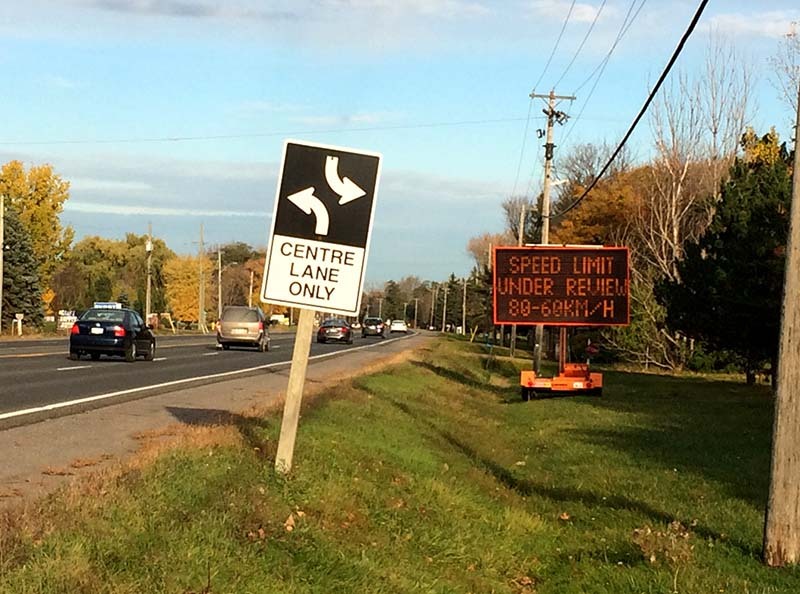 Signs on Highway 2 in Quinte West warn drivers about a potential speed limit change. Photo by Casey Horn, QNetNews. BELLEVILLE – Signs have gone up in Quinte West asking for opinions about a proposed change to the speed limit on a portion of Highway 2. The signs are part of a new policy to get public input before making a change in speed limits on roads in the municipality. The new policy comes after a speed reduction on Frankford Rd was quickly changed earlier this year when many residents complained about it. Director of Public Works and Environmental Services Chris Angelo says that the new policy grew in part out of that incident. “There was a fair bit of controversy about Frankford Rd earlier this year,” said Angelo. Now when a request is made to change the speed limit, signs are placed in the areas to get public input to go along with assessments made by police. The new speed limit on Highway 2 would drop from the current 80 kilometres per hour to 60 km/h, and would stretch from Wallbridge Loyalist Road to just east of Montrose Road. “The Ontario Provincial Police have reported accidents at that intersection (Wallbridge Loyalist Road and Highway 2) so it might make sense from a safety perspective to drop it before that point,” Angelo said. He also said that the opinions of the public along with recommendations from police would be presented to Quinte West council for consideration. Residents of Quinte West are invited to give their feedback about the potential speed limit drop at www.quintewest.ca.